Today was a big day for Apple, not only did they announce the iPhone 5, but updates to their iPod lineup that ended up being more significant than anticipated. In case you missed our coverage of Apple iPhone 5 keynote you will be glad to know that in this article we will be recapping the most important moments. This years iPhone keynote was held at the Yerba Buena Center in San Francisco. The event started at about 10am Pacific Time, where we were greeted by the fruit company’s CEO, Tim Cook. Cook first started talking about an Apple store that was recently completed in Barcelona. It took Apple nearly 3 years to complete and was actually constructed from limestone taken from a local quarry. After an Apple-esque video of the hand crafted retail store we were hit head first with retail and iOS stats; the most notable being. Did Someone Say iPhone 5? Phill Schiller took the stage next to talk about the highly anticipated iPhone 5. Just like all the rumors we have been hearing about the iPhone 5’s presentation was mainly focused around the new widescreen 4-inch Retina display, a completely overhauled design, unreal performance and 4G LTE connectivity. Display: Longer, widescreen (16:9) 4-inch display with the same 326 PPI display at a resolution of 1136 by 640. With the increased screen real estate an extra row of icons is possible, but the real benefit of the 16:9 resolution screen is for HD video. Applications not optimized for the iPhone 5 will be letterboxed. Design: The phone’s thinner and lighter, at 7.6mm and 112 grams in mass its 18% thinner and 20% lighter than the iPhone 4S. It features a dual-tone backplate, and comes in either white or black. A good way to image how thin the iPhone 5 is would be to essentially picture taking the back and front glass plates off your iPhone 4/4S, where you would be left with just the metal band. A smaller 9-pin dock connector dubbed Lightening will also make its way into the iPhone 5. Learn more about the iPhone 5’s Lightening dock. Specs: An A6 chip will be present in the iPhone 5 that is supposedly twice as fast as the A5 chip across the board. Battery life is also up in the iPhone 5 and it is estimated to offer 8 hours 3G talk time, 3G browsing, or browsing with LTE, 10 for WiFi browsing, 10 for video playback, 40 hours for music, and 225 for standby. Learn more about the iPhone 5’s battery life. Antennas: The phone supports 4G LTE in addition to DC-HSDPA and HSPA+, and is also enabled with 802.11n WiFi in both the 2.4 and 5GH spectrum, for speeds of up to 150 Mbps. And Much More: This really only scratches the surface of the iPhone 5, there is many more details to be learned about the new flagship smartphone and even its completely re-designed headphones that we recommend you read about by clicking here. As for the pricing and availability of the iPhone 5 you will be glad to know you can pre-order the handset on September 14th and actually purchase it on September 21st. On a two year contract, you’re looking at $199 for the 16GB version, $299 for 32GBs, and $399 for the top of the line 64GB edition. It is also worth keeping in mind that Apple is now dropping the iPhone 3GS as its entry-level phone and has replaced it with the iPhone 4. The iOS 6 firmware will also of course ship with the iPhone 5 and it is going to be released for older generation iOS devices on September 19th. It looks like the fruit company is finally giving iTunes the makeover it deserves. Apple will be releasing iTunes 11 sometime in October that will feature a redesigned player with new views, instant recommendations, an improved store, and deeper iCloud integration. MiniPlayer: iTunes 11 will feature a MiniPlayer that will be more functional than ever before. It will have the ability to control song playback, see a preview of the next song and much more. Expanded View: When you are actually browsing your iTunes library it will look more-or-less the same, but obviously more polished. There is less obtrusive recommendations, and better support for both Apps and Books. iCloud Integration: With deeper iCloud integration you will now be able to easily stream content without having to take up gigabytes of harddrive space. iTunes 11 will now also remember where you left off in TV shows, podcasts and much more. This is only a minute look into the world of iTunes 11 and you should read our in-depth review. Nope, Apple did not forget about their iPod lineup! In fact the fruit company actually did more work to the iPod Touch and iPod Nano than originally expected. The iPod Nano has been completely re-designed with a new multitouch 2.5-inch screen (supporting widescreen video), is only 5.4mm thick and comes in 7 different colors. It will have the same Lightening connector as the iPhone 5 and will include Bluetooth connectivity. Learn more about the 7th generation iPod Nano. As for the iPod Touch, it has gone on a diet and is ridiculously thin and light. More notably the 5th generation iPod Touch includes the iPhone 5’s widescreen Retina display screen, the iPhone 4S’ A5 processor with a dual-core graphics chip and of course a Lightening connector. It has had its camera system upgraded, comes in more colors than ever before, and even has better battery life. 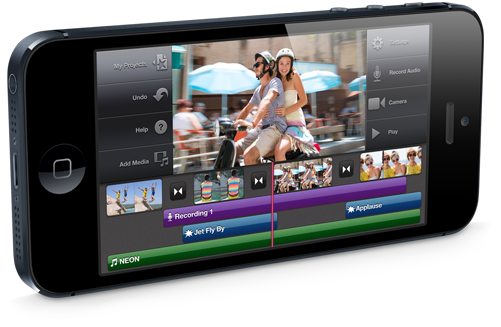 Learn more about the 5th generation iPod Touch. Not bad huh? For those of you who were expecting an iPad Mini or refresh Macs you will most likely have to wait until October, which is the date that is being rumored for another Apple keynote. What did you think of today’s iPhone 5 keynote? Drop us a line in the comments section below.